Do you want to look like this? Then make sure you do 2, 3 and 4! And for the eagle-eyed: the 'branch' with only 8 reviews is their head office! If you are new to Dialogue you will soon understand just how valuable each review is to you (see this article: 'Just How Much is a Single Review Worth'), and how effective Dialogue is in driving new business. "It would be helpful if you mentioned...[that you had considered other agents]" and "Do you remember that we...[recommended a great mortgage broker]"
"We really need your opinion, on our own site and on Google....because that's the way new clients find us nowadays." ...rather than dressing it up as 'customer feedback' (which most of us have learned to hate!). The calls (and other client contact) are key; get all your staff to familiarise themselves with the process - on desktop/laptop and on tablet/mobile, both for Dialogue and for Google - by writing real reviews of businesses they have used recently - and they will be able to empathise with their clients and explain the process to them, so your success rates will be as high as you need them to be. 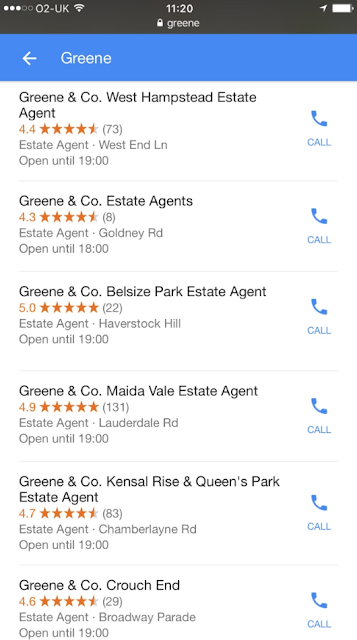 Getting reviews posted on Google via mobile and tablet: Google links change all the time (without notice) so warn your clients. They will be able to write (and copy) their review very easily as long as you explain the simple procedure. Note: Regular readers may recognise much of this article - please read it all - we never stop learning and refining our advice.